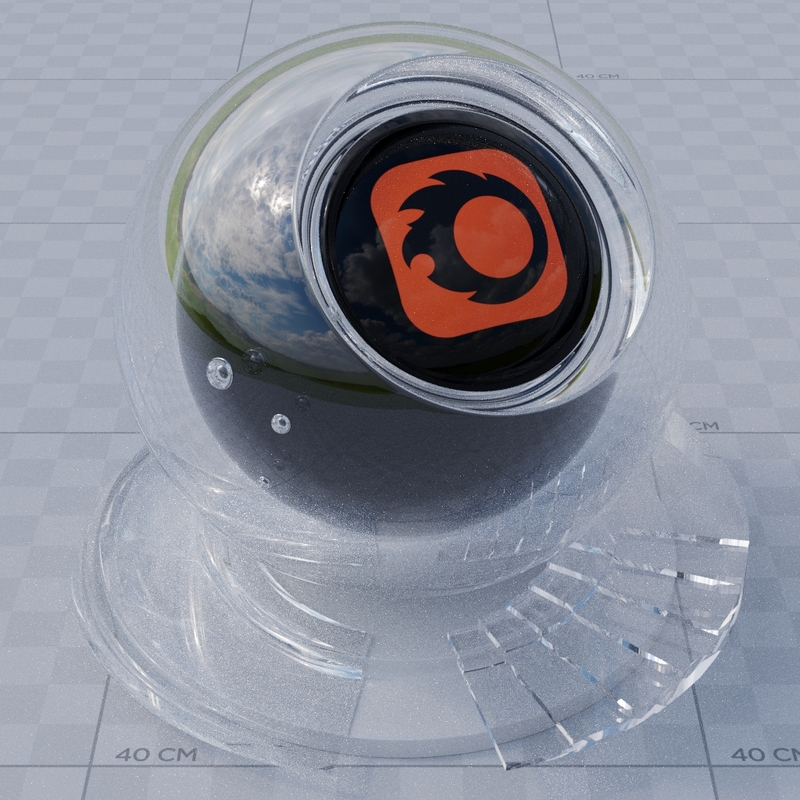 Below is a simple guide for setting up basic realistic glass or metal materials. For information on glass types, see: glass types. 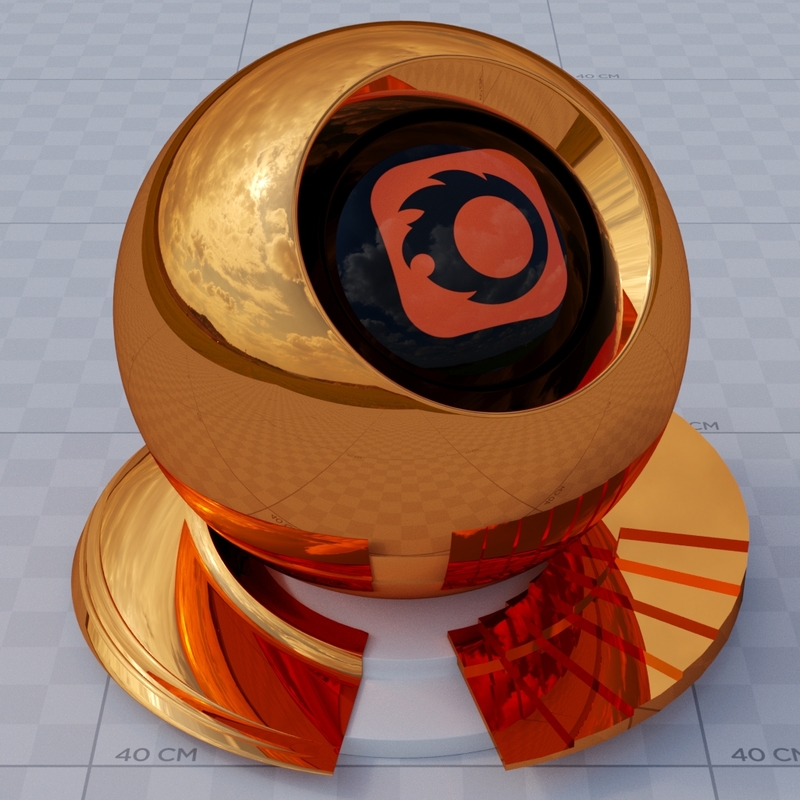 Use the materials from our Corona Material Library as bases for creating your own materials. This guarantees that the materials will be always set up correctly. 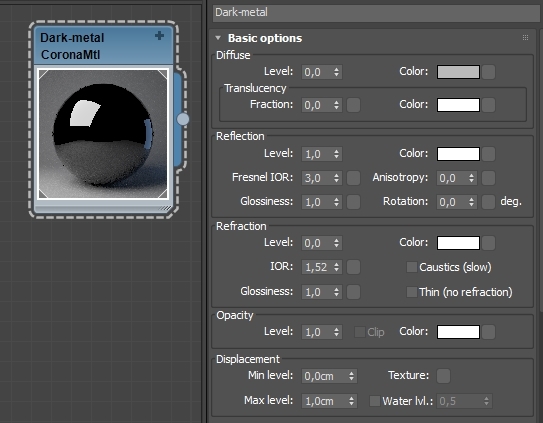 Tip: simply drag-and-drop a material from the Corona Material Library into the slate material editor. Download free high-quality material sets from the resources section on our website. 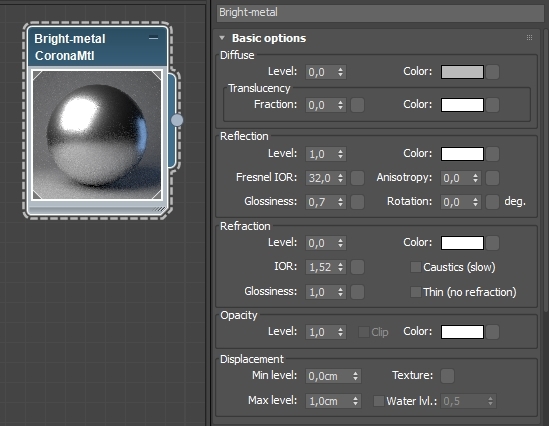 For metal materials, diffuse component should be disabled by either setting diffuse color to pure black, or diffuse level to 0. Reflection level should be set to 1. Fresnel IOR should be set to a high value, in this case 32. Additional detail, such as smudges or fingerprints can be added by plugging a texture into the material's reflection glossiness slot. 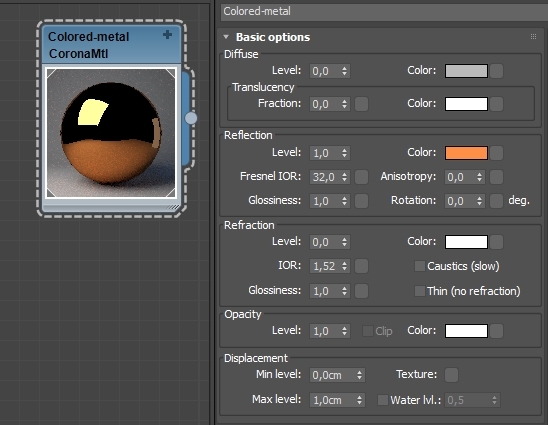 The color of metals should be controlled by their reflection color. Diffuse color should not be used, as in case of metals it should always be set to pure black (or diffuse level 0). Rougher metals will always appear brighter. 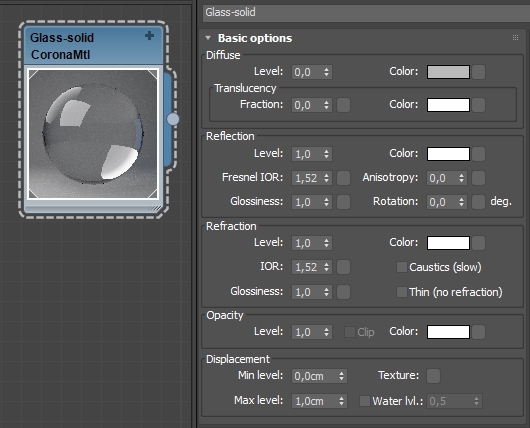 In this case, reflection glossiness was lowered to 0,7. Again, the diffuse color or amount should not be touched. Additionally, the realism of rough metal can be increased by adding structure to its surface. In this case a simple noise map was plugged into the diffuse slot. Metals with lowered Fresnel IOR value will appear darker. 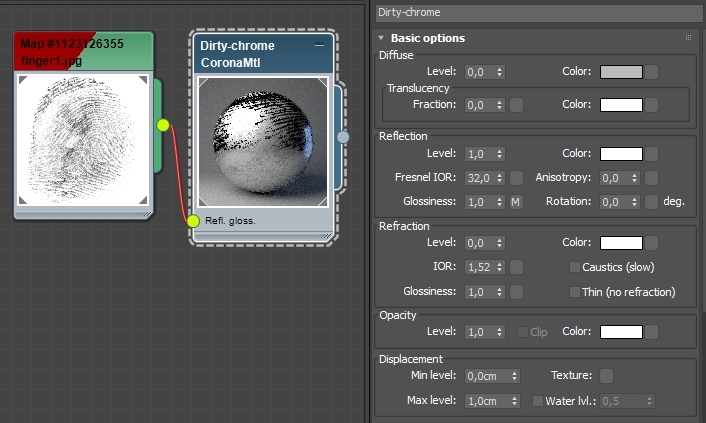 Diffuse or reflection level should not be changed. In this extreme example, Fresnel IOR was lowered to 3,0. 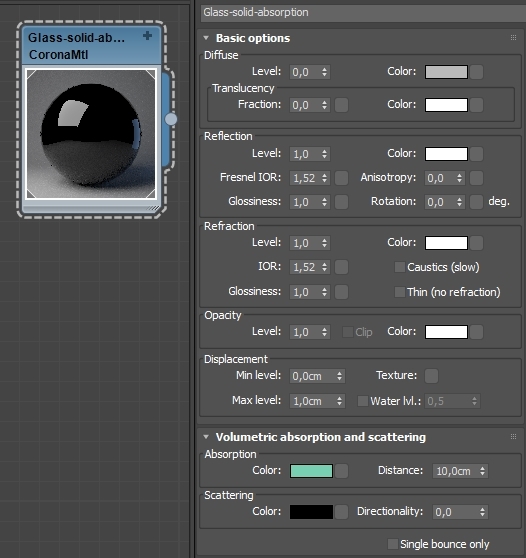 For glass materials, same as with metal materials, diffuse level should always be set to 0, or diffuse color set to pure black. 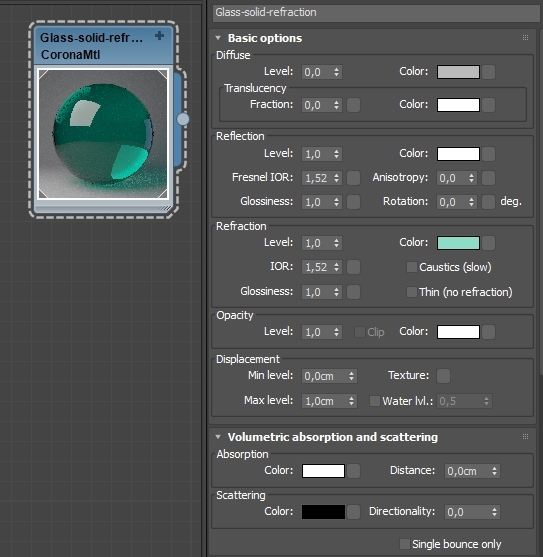 Reflection and refraction levels should be set to 1. 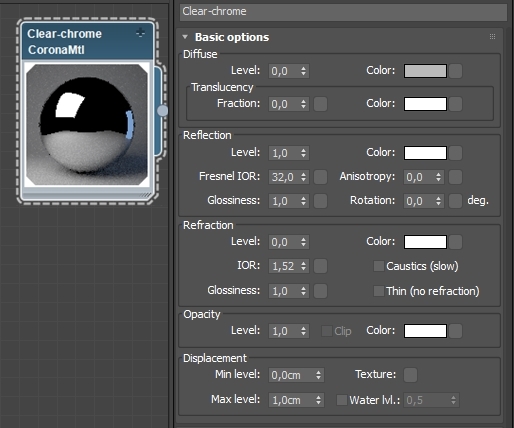 IOR under reflection and refraction should be left at the default 1,52, or slightly adjusted if needed. 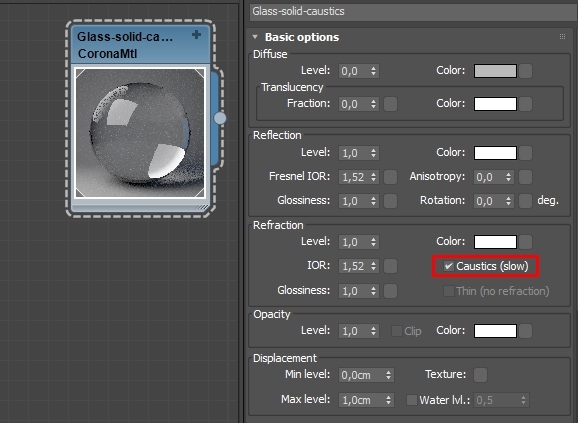 Higher values will make the glass appear "heavier" and more reflective; the value of 1,33 can be used for water material. 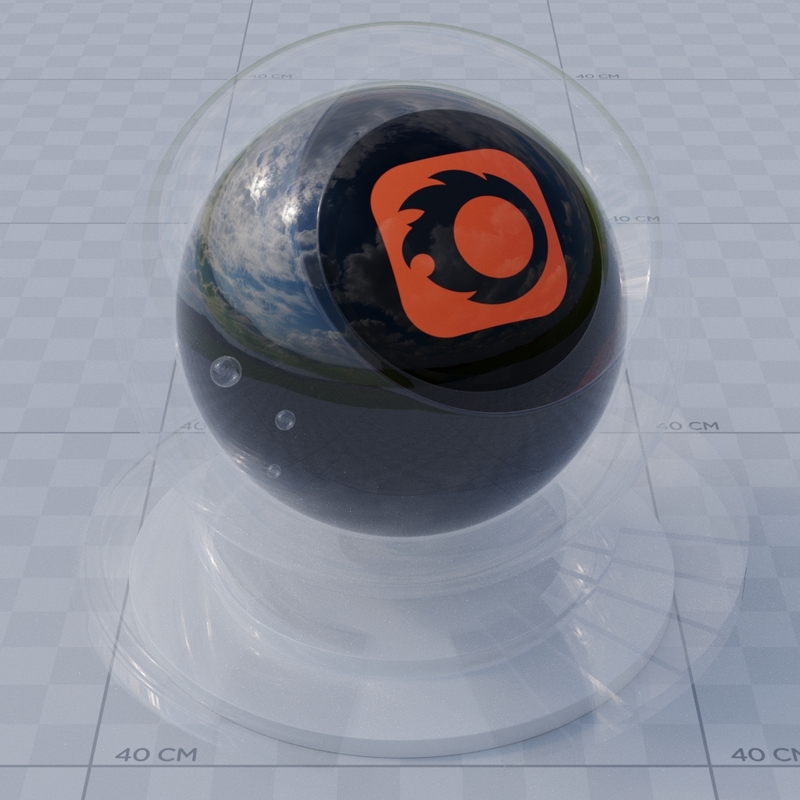 Caustics can be enabled for solid glass materials, however this will always make rendering much slower, and will introduce a lot of unwanted noise. It is recommended to always leave caustics disabled, unless they are absolutely necessary. 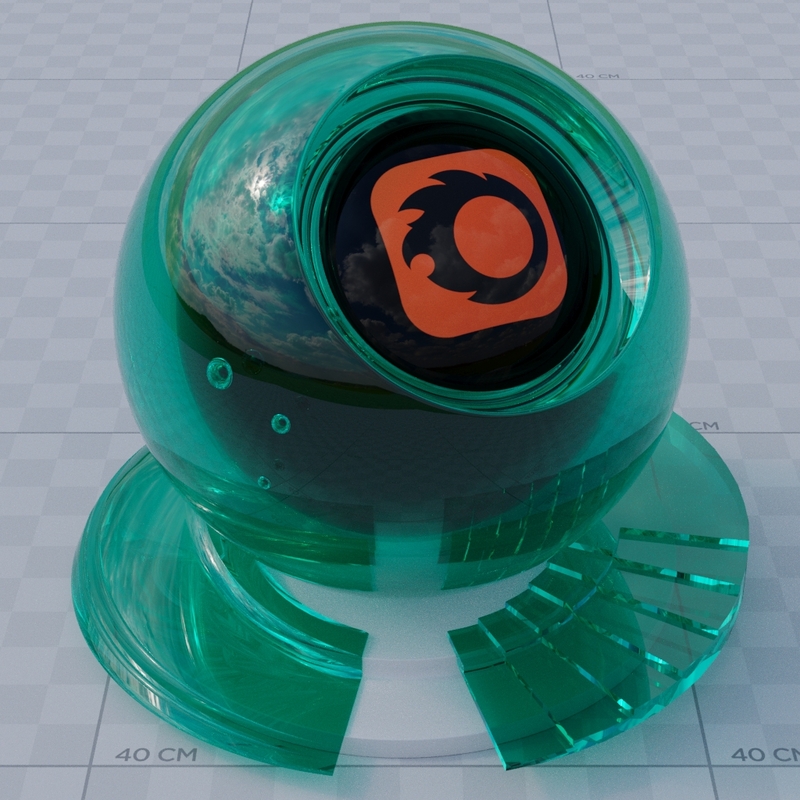 Absorption can be used to control the color of the glass material. 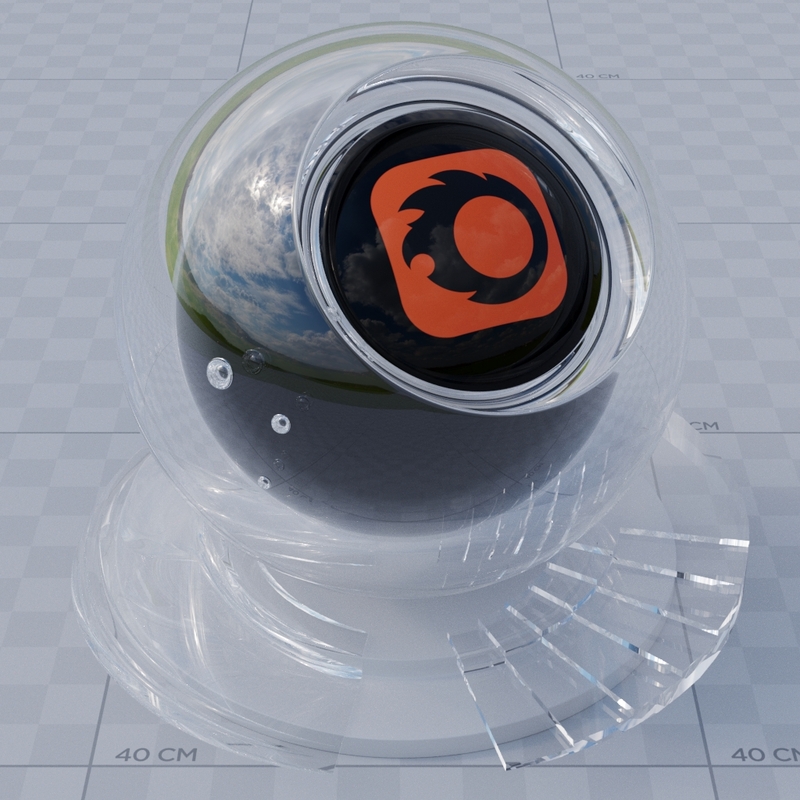 Absorption is a volumetric effect, so thin parts of the object will appear more transparent, and thicker parts will be more colored. 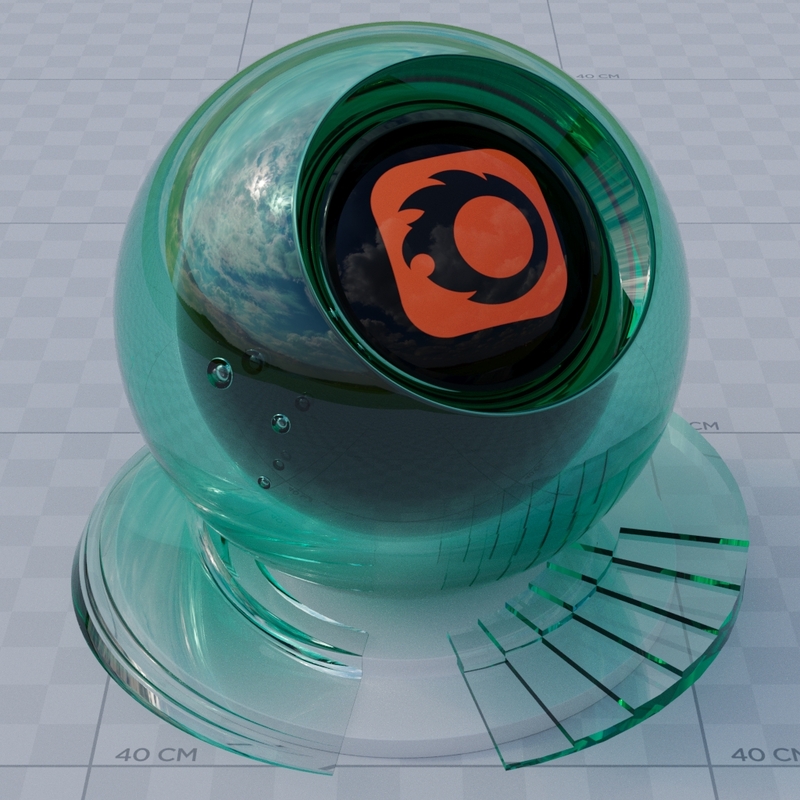 Refraction can be used to color glass as well, however it only affects the surface of the object, not its volume. The color will be the same across the whole object, regardless of its thickness. 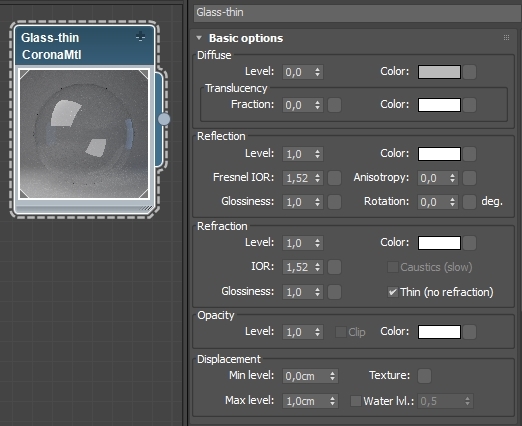 Thin glass mode should be used for flat glass planes that do not have thickess and do not refract light. This includes light bulbs, soap bubbles, etc. 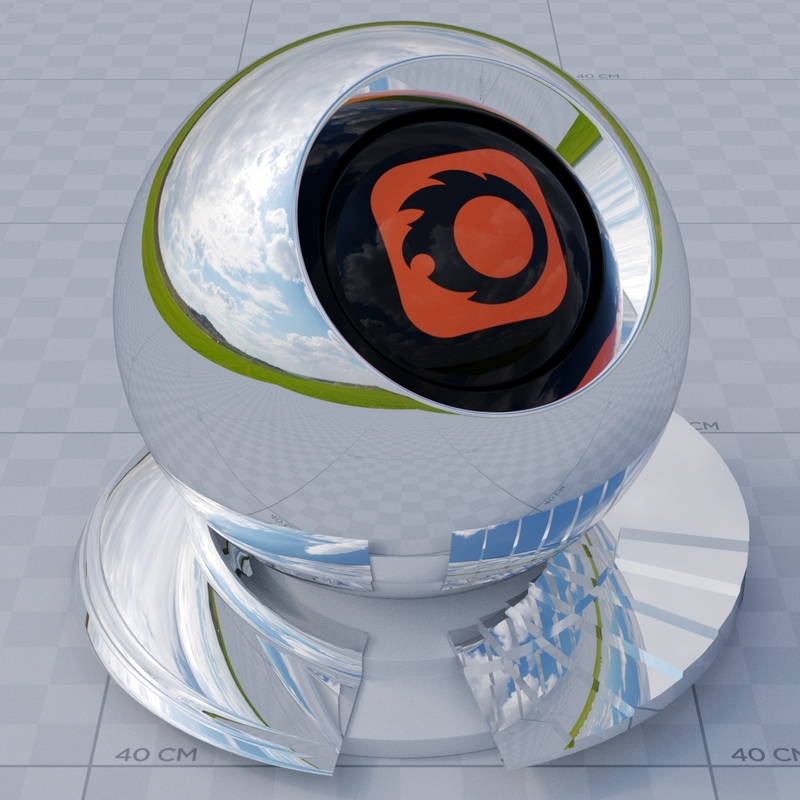 It can be also used for window glass to boost rendering performance.